Newark, New Jersey has often been used to symbolize the very idea of urban blight. Some say Newark never recovered from the 1967 riots when LIFE MAGAZINE featured a dead child on its cover under the headline: "Shooting War in the Streets: Newark, The Predictable Insurrection." But Newark has a new mayor, Cory Booker, who wants to change the image and the reality of Newark. "Newark is a frontline of what I believe is a fight for the American dream. And the idealism within the Kerner Report  I think has its roots in the idealism that in which this country was born. A country born in perfect ideals in my opinion. But, a savagely, viciously, imperfect reality. And I think Newark has been in the crosshairs in every generation of the fight to achieve America. And I think Newark is a city that's at that crossroads still." The Honorable Cory A. Booker, 38, is the Mayor of Newark, New Jersey. Mayor Booker's political career began in 1998, after serving as Staff Attorney for the Urban Justice Center and as a Program Coordinator of the Newark Youth Project. He rose to prominence by upsetting a four-term incumbent to become Newark's Central Ward Councilman. Booker has been profiled in TIME magazine, ESQUIRE Magazine (naming him one of the country's 40 Best and Brightest in December 2002), NEW JERSEY MONTHLY (naming him as one of New Jersey's top 40 under 40) and BLACK ENTERPRISE in December 2005 (naming him to the Hot List, America's Most Powerful Players under 40). Booker's first unsuccessful run against Sharpe James, the 20-year incumbent was documented in STREET FIGHT, shown on POV on PBS. In addition to being the Founder of Newark Now, Cory is a member of several boards including Integrity Inc's Board of Trustees, the Executive Committee of Yale Law School, Columbia University Teachers' College Board of Trustees, the Black Alliance for Educational Options, North Star Academy, and the International Longevity Center. This shining star reformer took his B. A. and M. A. from Stanford University, a B. A. in Modern History at Oxford University as a Rhodes Scholar, and completed his law degree at Yale University. Published on March 28, 2008. Bill Moyers talks with 91 year old activist, Grace Lee Boggs, about the cultural revolution brewing in our country at the grassroots level. The City of Newark Web site contains information on Mayor Booker's initiatives as well as city programs, information for businesses, residents and visitors. The site also provides translations into nine languages. The Academy Award-nominated film STREET FIGHT covers the turbulent campaign of Cory Booker, a 32-year old Rhodes Scholar/Yale Law graduate running for mayor of Newark, N.J. against Sharpe James, the four-term incumbent twice his age. At the Web site you can watch an excerpt, listen to an interview with the filmmaker, and find information on black mayors, Newark history and lesson plan. Follow the career of Cory Booker through THE NEW YORK TIMES archival collection of articles. "Why Cory Booker is mad as hell"
Debra Dickerson, Salon.com, July 5, 2007. "Enraged by his city's unfair drug policies, the Newark mayor vows to stop being polite and start making a difference." Watch video of Cory Booker, talking with David Remnick about politics and change in a troubled city. From �2012: Stories from the Near Future,� the 2007 NEW YORKER Conference. STOP SHOOTIN' INC. is a non profit organization based out of Newark, NJ whose mission is assist in reversing the trend of senseless gun violence in our inner cities by advocating peace amonst street organizations and youth. Located in New Jersey's largest city, YouthBuild Newark, Inc. (YBN) is a youth and community development agency founded in 2003 that serves at-risk youth and young adults ages 16 through 24. YBN is a 10-month program that provides: high school equivalency preparation, workforce and leadership development training, case management and civic engagement. YBN students include, among others, out-of-school youth and young adults involved with the juvenile justice system. Aired on POV on PBS, REVOLUTION '67 is an account of events too often relegated to footnotes in U.S. history � the black urban rebellions of the 1960s. Focusing on the six-day Newark, New Jersey, outbreak in mid-July 1967, the film reveals how the disturbance began as spontaneous revolts against poverty and police brutality and ended as fateful milestones in America's struggles over race and economic justice. This site, from Rutgers University, includes video and press coverage of the riots, demographic information on the neighborhoods involved, interviews with witnesses and biographies of the victims. Award-winning documentary maker David Hartman and historian Barry Lewis explore the culture, history, and people of New Jersey's largest city. From one of the country's oldest museums to a local delicatessen, get to know a bit about the colorful neighborhoods and vibrant past of Newark. Review the original coverage of the Newark events through this collection maintained by the Newark Public Library. Forty years after race riots in Detroit, Newark, and dozens of other cities stunned the nation, has anything changed? 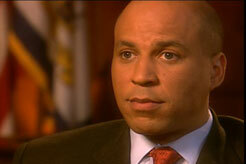 Bill Moyers interviews Newark Mayor Cory Booker for a frontline report on race and politics today. Find out what America's mayors really want for their cities and from the candidates. Plus, 10 things you probably didn't know about our cities. The Kerner Commission and the media  then and now. Tell us about the state of your city.